Sleep training techniques come under many names. Some names are quite accurate, some serve to help ‘soften’ what lies beneath. In the interest of integrity for those parents new to this game who are wondering what the differences are, I thought I’d help a little by defining what I think is the true meaning behind the sleep training names. CRY IT OUT – fairly self explanatory but still softened by not defining the ‘IT’ that is being cried out. The ‘IT’ is your child’s trust and belief that they will have their voice heard, respected and that they indeed matter at all once the night begins. ‘IT’ comes in the form of their heartbroken cries that go unanswered. Their whimpers, their deep sobs, their uneven breathing, their sweat, tears and drool. Possibly even their vomit. Extinction sleep training at its cruelest. Place your baby in their bed, walk out, close the door, don’t open door until the next morning. To put it simply, Cry It Out is night time child neglect. CONTROLLED CRYING– is also an extinction sleep training method with the same goal as Cry It Out but without the full blown neglect as you do actually go back in to your baby so you are, in effect, supervising them. Supervising is about it though. You go back in to ‘comfort’ and ‘reassure’ your child but without any real comfort or reassurance provided as you want to make sure your child is as ‘detached’ and ‘independent’ as possible and things like physical contact, eye contact and you know, genuine empathetic responsiveness, will only confuse your child or heaven forbid prolong their suffering as you are just going to walk back out to ‘allow’ them time to sort themselves out in a minute anyway. Oh but you’ll go back in again after the timer dings and tells you you can … it’ll be longer each time regardless of your child’s distress levels. But you know, it’s ‘controlled’? Yep, you have the control. You can follow this horrible protocol and bam, after about 3 nights or so, you will achieve full extinction… wow, what a wonderful technique. Extinguishing a helpless, completely trusting human’s belief that they can and will be heard when they cry out to their loved ones. Sounds like a great platform to build healthy sleep habits and relationships for life. CONTROLLED COMFORTING– same as Controlled Crying but see how the word ‘comforting’ sounds so much nicer?!? Like you ARE comforting … it’s just controlled… oh how lovely. Shame that it’s exactly the same technique just with a ‘softer’ name helping it with its PR. RESPONSIVE SETTLING/ COMFORT SETTLING– this is the one the sleep school I attended taught and advocates for. It’s more cue based than the good old timer that helps ‘control’ controlled crying and the comfort does escalate to full on in arms calming and settling once the baby is hysterical so I guess in some ways it’s kinder and gentler but it was enormously traumatic for my baby and still involved so much crying and still involved me being told to ignore his ‘protesting’ which still served to tell my baby that he couldn’t just expect to be heard and understood by calling out to me, nope, I had wait until he was ‘emotional’ which for my guy meant ‘hysterical’ as he was and is a 0-100 baby … all or nothing. This technique still works with the premise that you are teaching your baby to ‘settle’ themselves… something that is physiologically impossible. No baby or even young child has the emotional regulation required to settle themselves from a place of distress. Sarah Ockwell Smith and Dr Tracy Cassels do a fabulous job explaining this. This technique appeals to many who can’t ‘stomach’ the Cry It Out or Controlled Crying techniques but it begs the question, while the aims are the same – to extinguish a child’s ability to be heard, is it really that much better? CAMPING OUT– usually involves still ‘allowing’ your child to ‘settle’ themselves in their cot but they have you there with them offering your presence, maybe your voice but without being able to hold and soothe in arms. You gradually ‘camp’ further and further away until you ultimately leave the room. All sounds great if your child is calm and comforted sufficiently by your presence but for most babies, really you are just standing as witness to their distress as the comfort they need to soothe is not forthcoming. Babies need touch to regulate their system. Withholding your touch is still teaching your baby that their cries will not be understood. They want your physical touch and you give your physical presence. The mismatch is a significant confusion and barrier between you and your baby. NIGHTTIME FADING– this is a slow and gentler technique that sees you very gradually making changes and fading certain ways of comforting out of your baby’s sleep and settling rhythm. When done well, there should be little to no crying as your baby’s cry should be used as a sign to take a step back rather than ploughing on forward. If your baby is not ready for the fading it will not ‘work’ and that should also be respected and fading may be attempted further down the track if you so desire. Pinky McKay, Sarah Ockwell Smith, Elizabeth Pantley and Dr Pamela Douglas of The Possums Clinic, all offer more detailed information on attempting to make any changes to your baby’s sleep and settling. As Pinky McKay says, ‘gently and with love’ should always be your motto when trying anything new with your baby. The good old, ever popular ‘rip the bandaid off’ mantra is just downright cruel and heartless when it comes to a baby’s sleep. Our babies are new in this world. They naturally find comfort in our arms and at our breast. 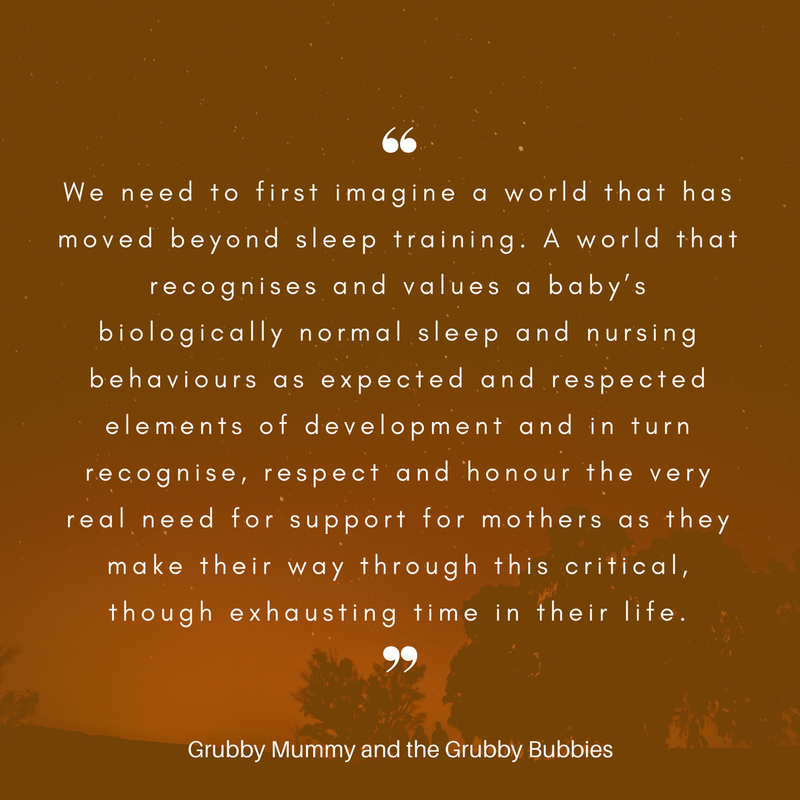 They do not have the physiological or emotional capacity to be ‘independent’ with sleep from a very young age and their sleep looks nothing like how society paints it. If you’re facing pressure to leave your baby cry or subject them to sleep training, I strongly ask you to do your homework on what normal infant sleep looks like, how it develops and what you can do besides sleep training to get through this time in your life. Our society is obsessed with sleep training but hates it when anyone scratches the surface to reveal what’s underneath. It is high time we as a society move beyond sleep training.